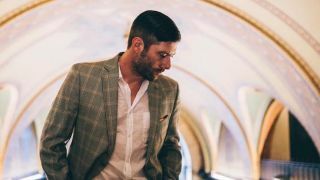 When not dressing like a tar-daubed witch or a zombie tourist in Limp Bizkit, Wes Borland has kept himself busy over the years with a number of side projects. His need to record cosmic death country was satisfied in Big Dumb Face, whose 2001 debut Duke Lion Fights the Terror!! featured his brother Scott. Then there was the moody alt-rock of Black Light Burns, who’ve released two studio albums and two collections to date. In between sporadic shows with Limp Bikzit, Borland plays guitar alongside his fiancée Carré Callaway in art rockers Queen Kwong. While Limp Bizkit’s seventh album Stampede of the Disco Elephants has been in the works for the last four or five years, the guitarist recently released his debut solo album, Crystal Machete. Written as a soundtrack to an imaginary ‘80s movie, it’s unusual for the fact it features no human vocals or distorted guitars. We sat down for lunch with Borland, who over a couple of crab rolls and Bloody Mary cocktails, told us about his tripped out concept record, Limp Bizkit’s legacy and why his new Detroit home has become something of a cat rescue. What sparked the idea to make Crystal Machete? It’s different to anything else you’ve done, so where did you draw inspiration from? What was the most enjoyable aspect about recording this album, then? Let’s talk about some of the tracks. What inspired the electronica of Svalbard? Similarly with Vltava, is this album about places you’ve looked at on Google Maps? White Stallion sounds like an ‘80s synth pop song. Where does the title Crystal Machete come from? Are film soundtracks something you could see yourself doing in the future? Are there any filmmakers that you’d like to work with? It’s a million miles away from Limp Bizkit. How do you feel about those early albums now? How did you end up in Limp Bizkit in the first place, when your influences are so different? Are you proud of what the band achieved? Do you still enjoy going out on tour with Limp Bizkit? How do you feel about being forever associated with the nu-metal genre? Are you at peace with that now? What do you think Limp Bizkit and Black Light Burns fans will make of Crystal Machete? Could you feasibly make a living out of doing that? We can’t end the interview on a downer. Tell us some good news before you go. Crystal Machete is out now through Edison Sound Records.